Part of The Walk at Jumeirah Beach Residence, the area known as the seaside promenade of Dubai, sits the JA Ocean View Hotel. 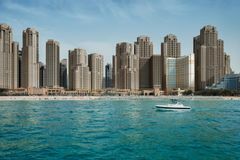 This contemporary 5* hotel has an excellent location for the beach, the marina and some of the best courses in Dubai. It is extremely comfortable with modern facilities, including a swimming pool, Calm Spa and a fitness centre. The beauty of JA Ocean View is that whatever room type you decide on you will be guaranteed a stunning sea view, with your own private balcony where you can watch the sun set over the Arabian Gulf. There is also an option for club lounge access to be able to relax on the 24th floor for the ultimate views of the city and seaside. The JA Ocean Hotel view has 334 rooms and suites and all with sea views, there is a swimming pool, health club and spa, along with six restaurants and bars. There are themed nights in the restaurants, along with poolside snacks. Be sure to check out Girders Sports Bar, their "British Pub" with live sporting action on a giant screen and outdoor terrace. If you need to go shopping then the hotel offer complimentary shuttle trips to the main malls throughout the day. Why not look at a two centre option and stay at their sister hotel, the JA Jebel Ali Beach Hotel with complimentary shuttle service available.